WASHINGTON -- An internet company is fighting what it says is a "sweeping" request for information about an anti-Trump website that prosecutors allege was behind destructive Inauguration Day protests here. The company says the government is seeking information about 1.3 million visitors to the site, among other information. Approximately 230 protesters were arrested, most on felony rioting charges, on Inauguration Day after some protesters threw objects at people and businesses, destroying storefronts and damaging vehicles, CBSNews.com partner website CNET.com reports. The arrests took place in a four-block stretch of downtown Washington around the time of Mr. Trump's swearing-in ceremony. 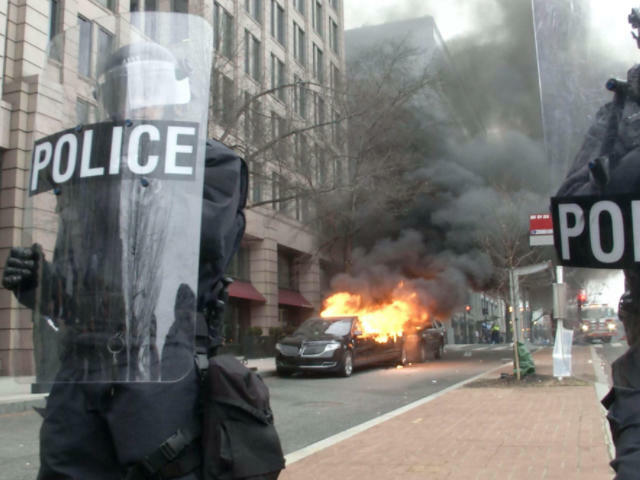 Prosecutors say the website disruptj20.org was used in the "development, planning, advertisement, and organization of a violent riot," and they obtained a search warrant in July ordering the company that hosted the website, DreamHost, to turn over information. But California-based DreamHost says the warrant violates the Constitution and a federal privacy law. The company said in a blog post Monday that it's being asked to turn over IP addresses of those who visited the site plus "contact information, email content and photos of thousands of people." The company said that "information could be used to identify any individuals who used this site to exercise and express political speech protected under the Constitution's First Amendment." "That should be enough to set alarm bells off in anyone's mind," the post says. A spokesman for the U.S. Attorney's Office for the District of Columbia, which is prosecuting the case, declined to comment beyond what had been filed in court. A court filing by prosecutors says the search warrant was "properly issued." It was revealed in March that prosecutors were trying to pull data from 100 locked phones seized during arrests made in Washington on Inauguration Day, according to CNET. Officials said they have search warrants to extract data from the phones. "Here, the concerns are exacerbated because we're dealing with core, protected First Amendment activities," he said.